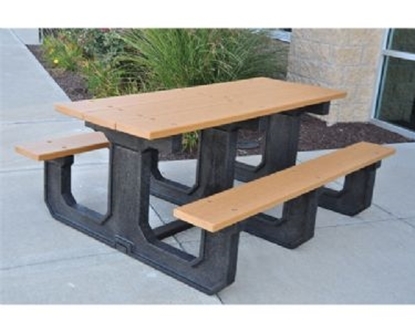 Quick Ship Outdoor Benches, 6 Foot Recycled Plastic Commercial Avenue Bench, 160 lbs. This 6 foot bench is in stock and ready to ship to your park, garden, or school. Made with 2 x 4 recycled plastic slats and a black recycled plastic frame. Recycled plastic benches resemble natural wood without splintering or cracking. Made in the USA with a 3 year manufacturer's warranty. • Ships Out in 3 Business Days Up to a Quantity of 4. Quick Ship 8 Foot Recycled Plastic Picnic Table, 450 lbs.